Last Update: 06/8/2018 at 4:27 PM ET. Thank you for your VIP purchase and supporting the 2018 Thunder of Niagara International Air Show! First things first, please bookmark this page. It will be updated through air show weekend with important VIP Customer information. It is accessible from any computer, tablet, or mobile phone. Please Arrive Early … Please Arrive Early … Please Arrive Early! We cannot stress this enough. Please arrive early, if not, you might be watching the air show in traffic with your VIP tickets in hand. We don’t want that to happen to you! Arriving early (before 9 AM) is the single best way to make sure you can see the entire air show. Because of MASSIVE demand for this year’s air show, there are times when traffic is going to be an issue. We’re going to do everything we can to minimize traffic. Please remember, as a VIP ticket holder you get EARLY air show access, not available to the public. You can enter through the main Lockport Road gate, after 0800 ET. Your VIP Ticket is your VIP Parking Pass. Please have your ticket ready to be inspected and scanned by Security Forces, BEFORE entering the base. Only printed tickets will be accepted for VIP Entry from Lockport Road. After you park, please bring your VIP ticket with you to gain access to the VIP area. A valid Photo ID (Driver’s License, Military ID, Nexus Card, or Passport) is required for consumption of alcoholic beverages, including alcoholic VIP beverage service. Because the Niagara Falls Air Reserve Station is a U.S. Military Installation, Security Forces reserves the right to inspect any vehicle for any reason. Your safety is our number one concern! There is no need to bring your own seating. As a VIP ticket holder we’ve provided more than enough chairs to make sure you’re comfortable. The VIP Area also includes tents for shade, so you can escape the sun or elements. VIP Tickets can enter through the Main Gate off Lockport Road. Once on base you will be directed to the VIP ticket area. If you’re unsure, please feel free to ask uniformed personnel on base. Below is a map marking the VIP areas. 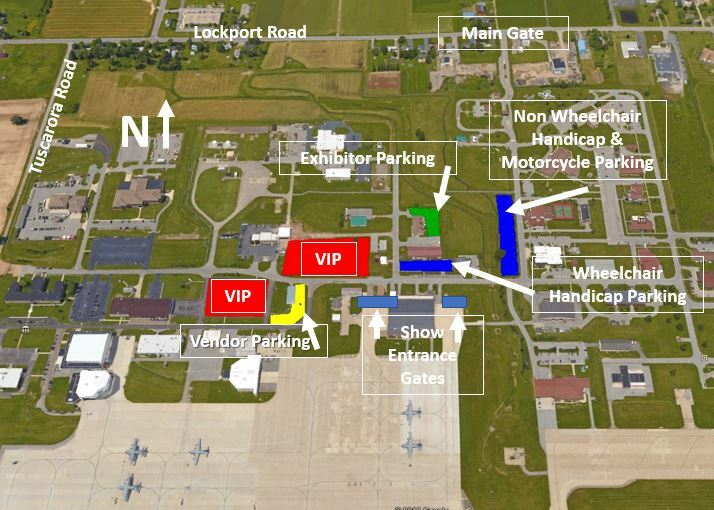 The VIP Area is located at the center of the flight line, directly in front of where the USAF Thunderbirds are parked. For Ticket Buyer Help please contact our ticket service provider AttendStar at (615) 223-1008. In order to ensure MAXIMUM FUN and minimum stress, please carefully review the following pages, BEFORE leaving for the air show. All the pages will be updated through air show weekend. There are a few points, in the links below, not applicable to VIP ticket holders.